Fieldwork is considered an important (if not essential) method to study a community. Through fieldwork a researcher can achieve a deep understanding of social actions, relationship and interactions. 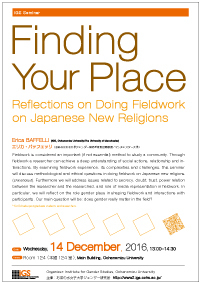 By examining fieldwork experience, its complexities and challenges, this seminar will discuss methodological and ethical questions in doing fieldwork on Japanese new religions (shinshūkyō). Furthermore we will address issues related to secrecy, doubt, trust, power relation between the researcher and the researched, and role of media representation in fieldwork. In particular, we will reflect on the role gender plays in shaping fieldwork and interactions with participants. Our main question will be: does gender really matter in the field?